Season of mists and mellow fruitfulness Close bosom-friend of the maturing sun; Conspiring with him how to load and bless With fruit the vines that round the thatch-eaves run; To blend with apples the mossed cottage- trees, And fill all fruit with ripeness to the core; To swell the gourd, and plump the hazel shells With a sweet kernel; to set budding more, And still more, later flowers for the bees, Until they think warm days will never cease, For summer has o'erbrimmed their clammy cells. Who hath not seen thee oft amid thy store? Sometimes whoever seeks abroad may find Thee sitting careless on the granary floor, Thy hair soft- lifted by the winnowing wind; Or on a half-reaped furrow sound asleep, Drowsed with the fume of poppies, while thy hook Spares the next swath and all its twined flowers; And sometimes like a gleaner thou dost keep Steady thy laden head across a brook; Or by a cider press, with patient look, Thou watchest the last oozings hours by hours. I am resisting temptation to pick one of these 'Gardeners Delight' tomatoes, ripening day by day, brightening up my patio. 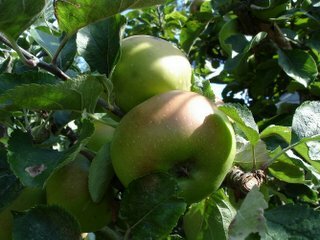 Season of Mists and Mellow Fruitfullness..
Let's hear it for the good old English Bramley! Hoooraaaaay! Did you know, the 'Ken Muir' fruit catalogue this year has cuttings taken from Mrs Bramley's original tree. You can buy a yearling fruit tree with a pedigree! These 'Harlequin' tomatoes are new to Thompson & Morgan this year on the front of their catalogue. They were most definitely the earliest of at least 8 varieties planted this year, and therefore I have had a continuous supply of ripe tomatoes since June this year. A good succession. I have found them however, to have a rather thick skin and most were about the size of a grape - owing to the hot weather this year. I will grow them because they are an early variety in future - they are also quite attractive, but will stick to Sungold next year. By the way, I read that a good way to preserve tomato seeds is to squeeze the pips out with the water and bits, into an egg cup and leave it on a kitchen windowsill for about 3 or 4 days - it might even go a bit mouldy, but never mind. The reason is to break down the sticky stuff surrounding the seed, it is then easier to wash off in a sieve and dry. I have done this already with good results. Anyone want some free seeds? My 'Marglobe' tomatoes have done exceptionally well this year. I planted quite a few different varieties of tomato on my tomato hedge, outdoors during this very hot, dry Summer. 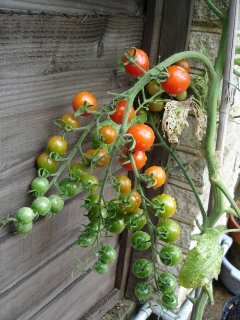 The 'Harlequin' tomatoes were the earliest to ripen but have been quite small due to lack of water. The Marglobe have been brilliant! Some of the biggest and best quality I have ever grown. Last year I nursed about a dozen plants, each singly pampered up its own stick and watered lovingly - the crop was quite good. 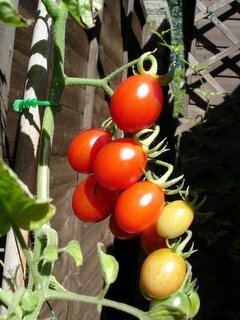 But this year, almost neglected because of the hosepipe ban and exceedingly hot weather they have done well. I suppose because they are essentially a Mediterranean hot country tomato and they have more 'meat' and less water. I ate a couple of really red ripe beefsteak tomatoes last week, in half inch slices, on a plate with fresh basil leaves and good quality olive oil, sea salt and black pepper. Mouthwateringly lasciviously, lipsmackingly brilliant! A watched pot never boils - or so they say! 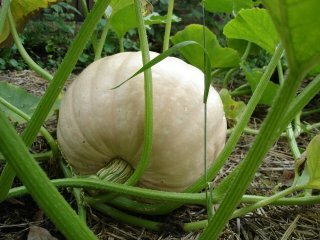 This one is about 14 inches in diameter at the moment, the shape is somewhat like a beer belly, whereas the second plant has a smaller but perfectly formed "Cinderella" shaped pumpkin. Still feeding with manure tea or Tomorite. I heard that real ale is quite a good feed - seems like a waste to me. 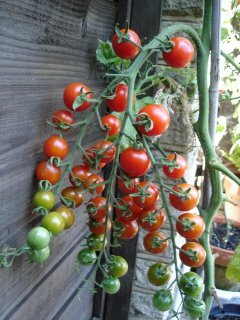 I have been resisting the temptation to pick the ripe tomatoes from the top of the truss just so that I can experience the effect of this string of jewels - compare with previous photo. You know how, if a magazine puts a photo of Princess Diana on the front cover the circulation increases by 100 per cent? well, this photo is not a vegetable in any sense of the word. 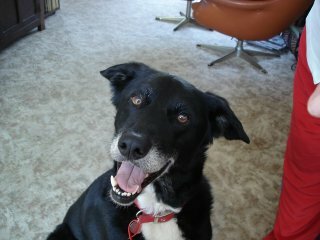 This is my dog Buddy. I took this photo at home after saying to him, "Did you want to go for a......?" At last! it's raining! Not just that pathetic damp air we have been having recently - that evaporates as soon as it hits the soil, I am talking about good hard, thumping, thirst-quenching, lip smacking, never-ending, RAIN. Haven't had rain like this since at least April or May. I look forward to going down on the allotment tomorrow and seeing what has grown. 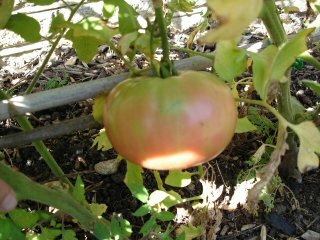 Pictured is my Gardeners Delight tomato. Like a string of jewels! This is my pathetic garlic! 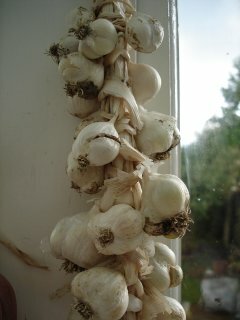 anyway - as the bulbs are small this is a good illustration of the method described in previous blog. Each month in Kitchen Garden magazine (brilliant!) there is a free seed giveaway. This morning a big envelope arrived with 10 packets of free seeds. These are all for Autumn planting right now, all are hardy veggies which will overwinter well. Some White Lisbon, Winter hardy spring onions; a couple of frost hardy lettuce; winter parsley; and some Japanese onion seeds with a name that is something like 'shitzu' or 'sen cha' - anyway. In view of my desire to fill my cavernous 'hungry gap'..... I will get planting. P.S. Anyone with a knowledge of the British 'Carry-on' films may have guessed that my love of the double-entendre is the reason I have this nickname. 1. Try to keep the leaf tops as long as possible do not trim them. When drying them it is best to string when they are slightly moist otherwise they will snap if they are bone dry. 2. Choose any onion with the longest, strongest leaf; this will be your primary vertical stalk. Take another onion and hold it next to the first, then take the second stalk round the back of the vertical then towards you, then under the neck of the 2nd onion , then take both stalks vertical. So the 2nd onion stalk has gone 360 degrees round the vertical stalk, under itself then up. 3. You should now have two vertical stalks, hold them together just above the join. 4. Take a 3rd onion, place it next to the 2nd and take the 3rd stalk 360 degrees right round the two vertical stalks, under itself and then up. You should now have 3 vertical stalks which you hold tightly just above the join. 6. It is important to keep hold of the vertical stalk just above the top onion at all times. When you have created your desired length.... tie a string round the top making a loop to hang it. Alternatively, start by tying string round the very bottom stalks and wind string round the central stalk all the way up for extra stability and then tie a knot and a loop at the top. 7. Trim the straggly bits at the top, stand back and enjoy your creation - hang them on your bicycle bars and ride round town! One of the most satisfying jobs in the garden this time of year is stringing onions. There are several different ways of doing this, most of them are based on the same ideas. You can either do it with string, or for purists - like myself - without string. I will try to take photos, or make drawings to illustrate. Yes folks ! I have puddled in my leeks. I planted a pot full of leek seeds back in the late Spring, unfortunately these were some of the casualties of going away on holiday for 2 weeks in June. Sadly only one out of about 100 survived! 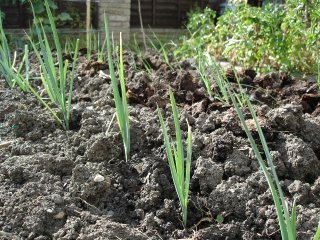 Found a garden centre with some un-named leek seedlings and planted them out a few weeks ago. Isn't it annoying when a garden centre just sells seedlings as "leeks" or "cabbage" or "tomato". I always feel it would look pedantic to ask the staff which variety they are. Anyway, back to the leeks. I have always found leek seedlings to be as tough as nails. Plop them in, give them a hair cut and puddle them in. Only 2 weeks ago this first row were just like chives, now they are the thickness of a pencil. I have always grown blanch leeks. Has anyone ever tried pot leeks? How do they differ? Any recommended varieties?